Just hours before the 2017 DCI World Championship Finals on Saturday, August 12, hundreds of spectators were treated to a roaring, booming percussion competition in downtown Indianapolis. Teams from all over the world congregated at Pan Am Plaza to hype the crowd, showcase their chops and — most importantly — express that percussion is a language anyone can speak, regardless of background. 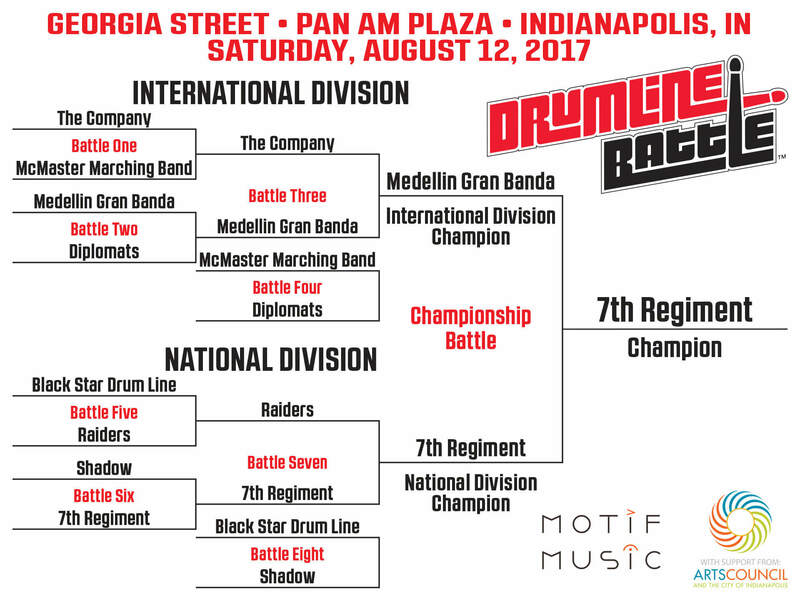 Medellin Gran Banda, which hails from Colombia, were the winners of the 2017 DrumLine Battle International Division and overall, 7th Regiment took the DrumLine Battle Indianapolis championship title for the third year in a row. Like many of Saturday's ensembles, 7th Regiment's repertoire was not short of flair thanks to DrumLine Battle's focus on stunts, unique moves, one-upmanship and attitude. Beyond their usual assortment of percussion instruments, 7th Regiment members also brought a gigantic inflatable duck and at least 20 smaller rubber ducks onto the DrumLine Battle stage to set the scene. This year's DrumLine Battle also welcomed newcomers to the fray. The Black Star Drum Line represented Madison, Wisconsin and made its debut on the tarp, competing against lines from Open Class DCI corps Raiders and Shadow. British team THE COMPANY shows its national pride with Lucas Oil Stadium as a backdrop. 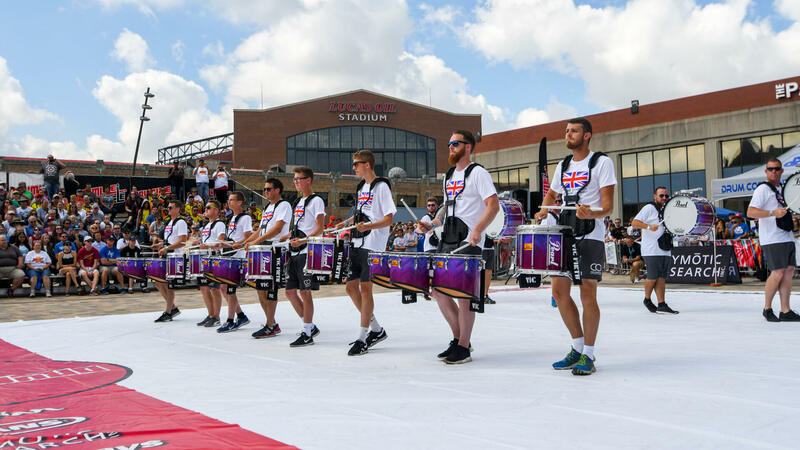 Hubeit, who previously marched as a member of Shadow, said the laidback DrumLine Battle atmosphere is incredibly enjoyable, particularly in comparison to a more formal drum corps setting. Results of the bracket-style competition were determined by a panel of three judges, who were positioned in the middle of the DrumLine Battle performance tarp, facing directly toward the performers. This year is Brian Calhoun's second year as a DrumLine Battle judge. He said the biggest change this year were the venues, leading to a different listening experience for both judge and audience. Shadow's DrumLine Battle team plays to the crowd on downtown Indy's Pan Am Plaza. Calhoun said DrumLine Battle shines because it sets the stage for any percussion ensemble to let loose and interact with the crowd in ways unfounded in the typical marching band or drum corps setting.